Internal Audit Capabilities and Needs: Where do you rate? 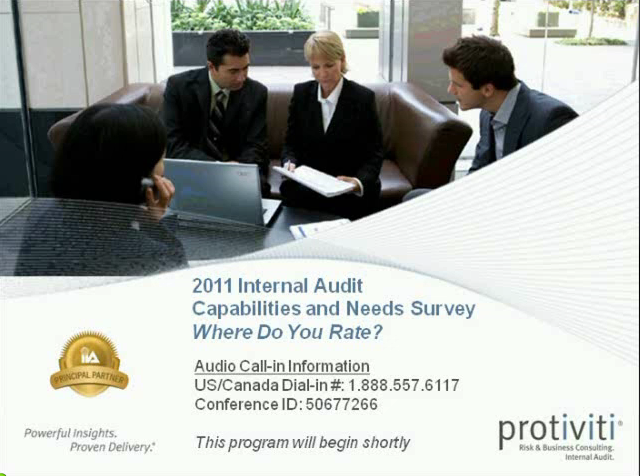 During this webinar, we will provide an overview of the results from the 2011 Internal Audit Capabilities and Needs Survey along with commentary on some of the more interesting trends that have emerged in the past year. As global markets continue to emerge slowly from several years of economic instability, increased regulatory oversight (e.g., the Dodd-Frank Wall Street Reform and Consumer Protection Act) and greater attention to risk management are monopolizing more and more attention of boards and executive management. To support their organizations in these endeavors, internal auditing professionals are seeing greater demands on their time and skills to help improve organizational processes while ensuring proper risk management and controls are in place. It is in this environment that Protiviti conducted its fifth Internal Audit Capabilities and Needs Survey. Participants, including chief audit executives, internal audit directors, managers and staff, answered more than 100 questions in four categories: General Technical Knowledge, Audit Process Knowledge, Personal Skills and Capabilities, and a new category to the study, Risk Management and Governance Process Knowledge. We sought to obtain data from survey participants regarding their knowledge of competencies in this subject area given the growth in demand for risk management and governance-related skills over the past year and the impact this demand is having on internal audit functions. Title: Internal Audit Capabilities and Needs: Where do you rate?